For our third stop in Algeria This month, I am sharing with you a colorful salad that rocked my childhood: felfla or slata mechouia. 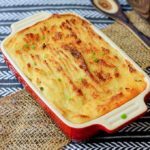 This salad, popular throughout the Maghreb, is known as hmiss (حميس,), chleta, felfla (فلفلة) or felfel b’tomatich in Algeria, slata mechouïa (سلاطة مشوية) in Tunisia or taktouka in Morocco, although some of these names are used interchangeably throughout North African countries. Hmiss (hmisse, or h’mis h’miss) is a salad of roasted peppers and tomatoes, topped with olive oil, which is one of the most popular appetizers during the month of Ramadan. 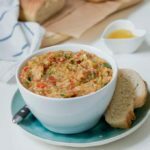 It can be served warm or more frequently cold and ideally enjoyed with a good homemade bread such as kesra that Vera prepared a few weeks ago, matlouh (or matlou3) or a Kabyle galette called arhlum (or aghroum). In my mother’s family who is originally from Tunisia, this salad was often present at the Shabbat dinner tables. It’s often called slata mechouia, which means “roasted salad” in Arabic. Indeed, peppers and tomatoes should be roasted, ideally on an open fire, to give them that inimitable smoky flavor. Nowadays, most housewives cook the vegetables under the broiler. I personally used my BBQ this time. I prepared the salad for the Mimouna feast this year. 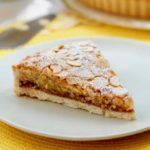 Mimouna is a festival celebrated at the end of Passover. After 8 days of deprivation, e.g. leavened bread among others, we splurge with various breads, couscous dishes and other pastries. 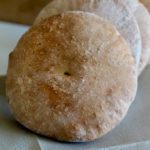 This year, I decided to prepare mssemen or moufletas (flaky Moroccan pancakes), Algerian couscous with butter and Tunisian sandwiches with homemade Italian bread. 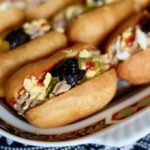 In Tunisia, slata mechouia is also a must-have filling for Tunisian sandwiches, but also for fricassés, small fried breads among filled with tuna, hard-boiled egg and harissa. 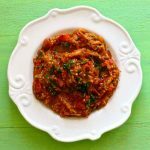 Although this salad has very few ingredients and is relatively simple to prepare (the longest being roasting and cleaning peppers), it comes in several versions depending on the region. 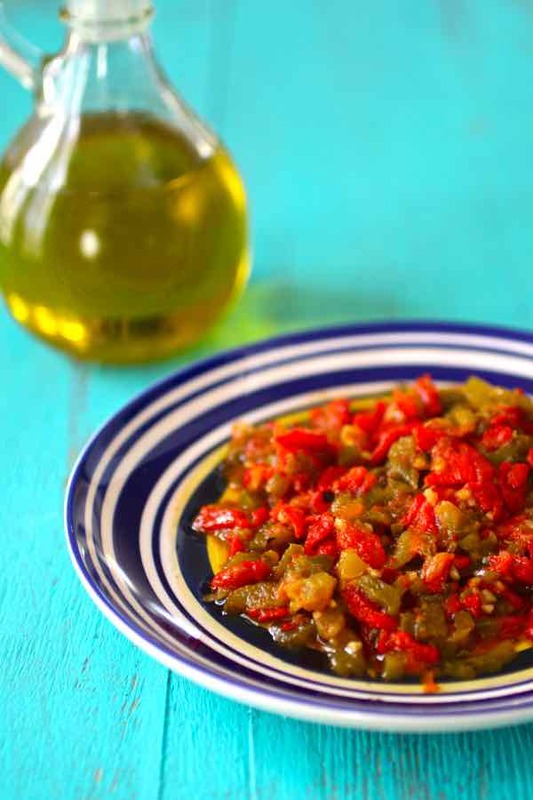 In eastern Algerin, felfla is prepared with garlic, roasted peppers and tomatoes. 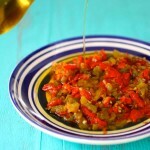 In Kabylia, this salad is also prepared with roasted peppers and tomatoes. It is then seasoned with olive oil. Sometimes, people add beaten eggs, which are mixed in the salad and allowed to cook gently. 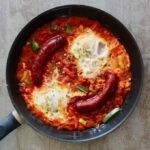 This version is reminiscent of shakshuka, a dish whose origin is often attributed to Tunisia and which is now known in Israel and worldwide. 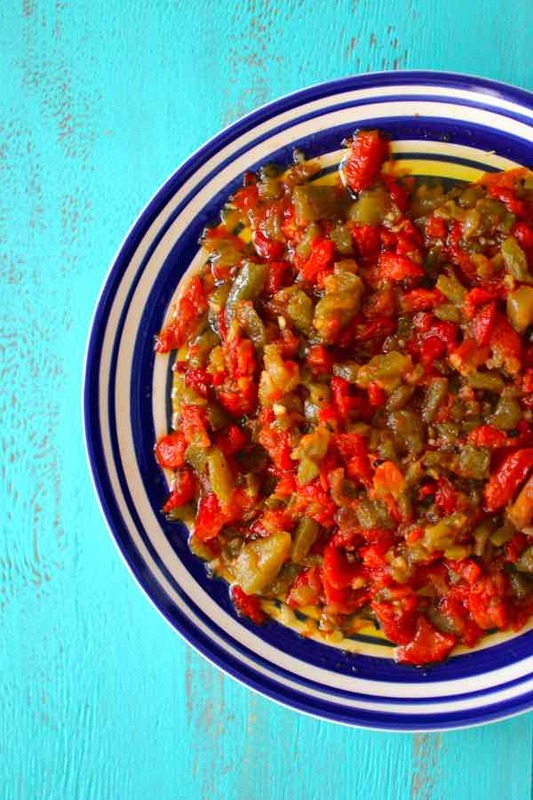 In Tlemcen, northwest of Algeria, felfla is prepared with peppers, tomatoes, olive oil, garlic, eggs, fresh cilantro and is caraway. In Tunisia, when slata mechouia is not used to fill sandwiches or fricassés, it is often served with canned tuna, hard-boiled eggs and black olives. 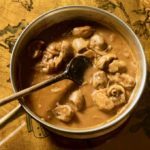 In Morocco, taktouka is occasionally prepared with cumin, fresh cilantro or parsley. Pepper is a popular fruit (yes, it’s a fruit) in Mediterranean cuisines. But this craze is relatively new. Indeed, it is Christopher Columbus who brought pepper to Europe upon his return of his first trip to America. The Spanish and the Portuguese then helped spread it worldwide. In North Africa , it is probably the Turks who introduced its cultivation and consumption. Indeed, in some regions of Algeria, pepper is still designated by a Turkish term: torchi. 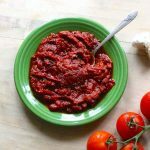 Felfla is also reminiscent of ajvar, another roasted pepper salad that is very popular in the Balkans, but distinguishes itself by the addition of eggplant. 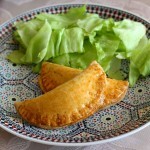 In Algeria, a preparation similar to felfla is also used as a stuffing for Algerian coca, a kind of mini empanada or stuffed turnover. 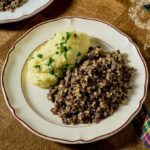 Even if the recipe for felfla calls for very few ingredients, there are dozens of ways to prepare it. Some prefer to boil the tomatoes instead of roasting them. Others prefer to crush the fruits (yes, tomato is also a fruit) rather than cutting them. With garlic or without garlic? Reduced or not? In any case, this salad is a healthy and simple appetizer that smells like the Mediterranean and that will delight your guests during summer BBQs, picnics, or during the month of Ramadan. 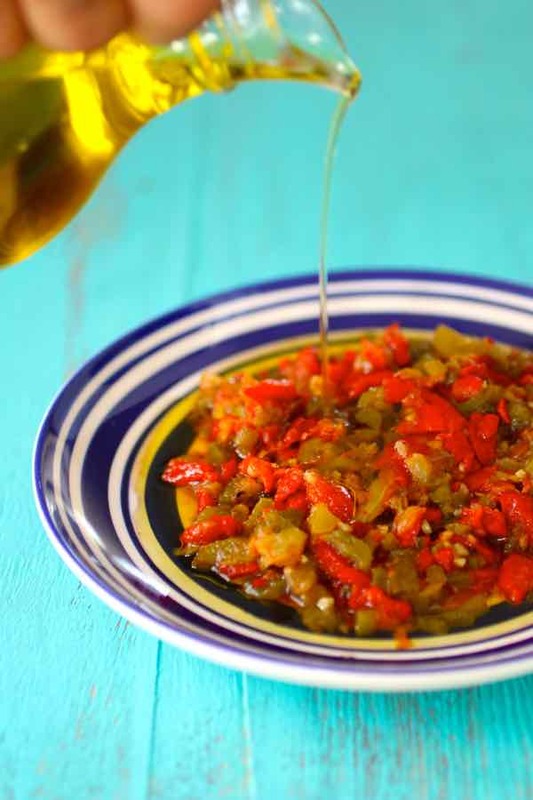 Felfla, hmiss, slata mechouia or taktouka is a salad prepared with roasted peppers and tomatoes, that is very popular in North African cuisine. Roast the peppers and tomatoes on the grill, on the flame of the stove or under the oven broiler, for about 20 minutes. Place the peppers in a closed plastic bag for a few minutes so that the skin comes off easily. Peel the peppers and tomatoes. Remove the stalks and clean the peppers. Coarsely chop the peppers and tomatoes with a knife and fork. Sauté the garlic in a pan with 2 tablespoons of olive oil over medium heat. After a minute, add the peppers and tomatoes. Sauté a few minutes. Add salt and pepper. 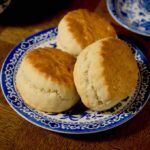 Serve warm or cold with a drizzle of olive oil. Thanks so much Islam. Really appreciated. Really love what you’re doing, thank you!!! I’m going to make this next shabbat. Thanks! You’re welcome Zehava. Shabbat Shalom!